The brief from Sony was to promote their new Sony 4K Action Cam, FDR-X1000V and highlight it as an ideal lightweight, easy to use camera and develop a campaign that can be rolled out across Europe. So with wedding season in full swing and in true Hope and Glory style we wanted to create something tangible that would get tongues wagging. We teamed up with the lovely Rosie Olivia, who has designed hats for the royal family and a number of high profile celebrities, to develop the world’s first “wearable technology wedding veils collection” – designed to capture a unique view of matrimony, from the bride’s eyeline. 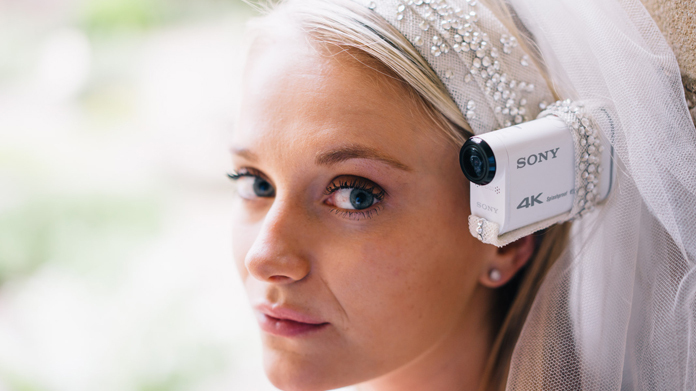 On the back of research which found that over a third of married Brits regret to not having a wedding video, we didn’t want people missing out on their special day so the bridal accessory has been engineered to provide unique first-hand footage that can be edited into their wedding video. Rosie Olivia has introduced two pieces to the wearable collection, the first piece is a stunning crown, complete with tiny crystals fit for any princess on her wedding day and the second piece of headwear is simpler with an understated design which hides the lightweight Sony Action Cam in a subtle and elegant way. And it seems as the whole ‘would you / wouldn’t you’ wear it debate has become a talk of media land across Europe. It’s done lovely tiptop work coverage-wise, appearing in Metro, Daily Star and The Sun in print, as well as a clean sweep of national and consumer fashion and tech onlines with, for example, the Daily Mirror, Daily Express, Reveal, Instyle, Glamour, Gizmodo . What’s more, it’s been the topic of conversation on the biggest Irish radio show and various European titles too. We’ve even had a few requests from people who actually want one to be made for their own weddings!